Time Jumping, remnants, speeding up ones own time is allowed. Other forms of time manip is banned. No Summons, constructs or any other fodder stronger than 616 Bleeding Edge Iron Man. Indestructible planet inside a Solar System like others, with no other people on it except for the fighters. @boschepg a worthy opponent! Best of luck to you man! Would you care to go first? I am unfamiliar with almost all of your characters. Basically she does force field magic and healing. @boschepg: Is this your full opener or are you adding prep, strategy, etc? @geekryan: this is just an intro. Ok cool! I should have my post up within 2-3 days! According to Green Arrow, Zatanna is the most powerful member of the Justice League. 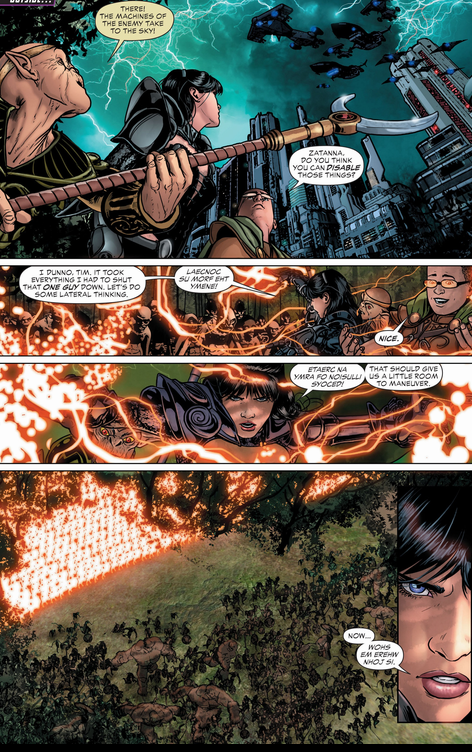 She is also considered to be one of the most powerful magic-users in the DC universe. I won't go much into her history because you can easily find that on her CV page. In tribute to her father, she tends to cast her spells by speaking backwards, but she has shown on many occasions that she can cast spells without speaking at all. She is a high-tier reality warper, capable of affecting the entire universe, going up against universal threats, and altering both space & time. Her power is practically limitless. Martian Manhunter (or MMH) is considered to be one of the most powerful members of the Justice League, and has been stated to be more powerful than Superman on multiple occasions. He is extremely versatile, a "swiss army knife" of superheroes. He is also the most powerful telepath on Earth. Here is his CV page if you need more information. I have chosen the Light Speed perk for Zatanna. Zatanna's main disadvantage in combat is her speed. Since she is human, her reaction speeds are average and she needs to be able to speak her spells backwards (in most cases) in order to cast them. This perk enhances her combat, travel, and reaction times to the speed of light, which is equivalent to roughly 200 thousand miles per second. This will allow Zatanna to speak and cast her spells at light speed, which is significantly faster than the speed of thought. In fact, in terms of miles per hour, light speed is roughly 3 million times faster than the speed of thought. This will allow her to cast multiple spells in the span of a second. It also serves to increase her defensive capabilities, allowing her to react to attacks and either dodge or block them much more quickly. More importantly, this puts her speed way above anyone on your team except Rukia since she also has the same perk . I also have an army of 200 Chitauri (from MCU's "The Avengers") and 1 hour of prep on the battlefield. The Chitauri are a race of cybernetically-enhanced aliens. They have superhuman physical attributes and are strong enough to briefly contend with Captain America. They also come equipped with energy rifles capable of firing shots strong enough to hurt and knock down Captain America. Lastly, they also have timed explosives that can create large explosions upon detonation. Individually, they aren't too threatening, but their power comes with their numbers. A large group of Chitauri were even able to overwhelm the Hulk with their energy rifles. My army of 200 Chitauri will be enough to match your team, at least for awhile. They will serve as a very good distraction since they will become overwhelming if left unchecked. Their use will be explained in the following sections. With my 1 hour of prep on the battlefield, I will do a few things. The first thing I will do is have MMH establish a psychic link for my entire team. This will allow them to communicate telepathically throughout the entire battle. Since Zatanna and MMH are both part of the Justice League and have worked together in the past, they should have a decent amount of teamwork and know of each other's capabilities. A telepathic link will allow them to improve their teamwork, coordinate their strategies and attacks, trade information and knowledge about their powers/abilities with the Chitauri, and integrate the Chitauri into their plans. He will also shield their minds from telepathic intrusions, like he has done so with the JL on numerous occasions. 1) One of Zatanna's more uncommon powers: divination. She can meditate or use a special deck of Tarot cards to see into the future. This divination isn't too specific and isn't as powerful as what Madame Xanadu can foresee, but it is simple enough to give her concepts of what will happen and who might be involved. In this example, she foresees the Trinity War. She sees someone dying, Constantine arguing with Batman/Superman, superheroes fighting each other, and Constantine shaking hands with Lex Luthor. All of this ends up coming true. Now I'm not saying that she will be able to see specific parts about the upcoming battle, but she will be at least able to see who is involved and have a general idea of what will happen. This gives us the advantage of having "basic knowledge" on your team and will allow us to better prepare for the fight. Due to the telepathic link, Zatanna and MMH will relay this information to the Chitauri. Now, my team knows who we will be fighting and will have a general idea of what you are capable of. 2) Zatanna will then enchant the area around us, putting up protective enchantments as she did with her mansion. As stated by the Nightmare Imp, the enchantments aren't just on the mansion itself, but extend to the area beyond the fence, meaning it can affect an area and not just the building. Those who cross into the enchanted area are teleported hundreds of miles away and transformed into a mollusk for an hour. Although BFR isn't allowed, they can still be transformed into a mollusk and teleported away from Zatanna. Realistically, she could cover as much area as she wants with this spell, but to avoid any arguments about size, I would say her enchantment could at least cover the area of land her mansion is on, which is quite large, at least 500 square feet (the size of an average mansion). No one on your team has the magical capability to detect this enchantment, resist it, and/or remove it. 3) Next, Zatanna will enhance the army of 200 Chitauri. She will turn off gravity in the area as she does in the following scan for her and Batman. This will allow the Chitauri to "fly". Batman adjusted to the lack of gravity quite quickly, so the amount of time we have for our prep should be more than enough to get the Chitauri accustomed to the lack of gravity. Now, I have 200 flying Chitauri. Zatanna and MMH are used to flying so they won't need to adjust to this. Your team, however, will not be able to adjust to the change in gravity, unless they are casual fliers. Next, I will make the Chitauri invisible and create a decoy army of them as Zatanna does in this scan. Now I have 200 invisible, flying Chitauri and a decoy army of Chitauri that will stay on foot to serve as a distraction. These decoy illusions won't be a physical threat (they cannot cause any physical harm and disappear upon being attacked), but they will distract your team. Zatanna will then make herself invisible, as she has done on multiple occasions. MMH will turn himself invisible as well. Since Zatanna can now work at light speed, she will be able to do all of this in a very short amount of time. She can then use the rest of the hour to relax, meditate, and restore her energy. Once your team spawns, they will only see an army of Chitauri charging towards them. Since my actual team is invisible, the decoy army will be the focus until your team can determine that my team is invisible. But by then, it will be too late. My real army of Chitauri will begin firing their energy rifles onto your team. You will see the blasts being fired, but you won't see from who or from where, since they are invisible and flying. Since you provided no real durability feats for anyone on your team, these blasts will severely injure or kill anyone on your team. 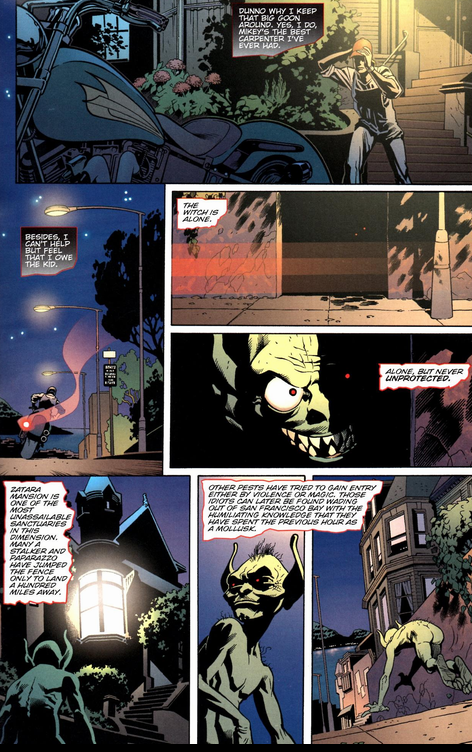 Martian Manhunter has never been shy about killing and he does not have a strong morality against killing like Batman has. In fact, Black Adam has noted that MMH is different from the rest of the JL in that he would kill him if he had the chance. Against opponents that he does not know, and in situation where he is fighting for his life, he will not hesitate to use lethal force. Zatanna does not usually kill, but she is certainly not passive about fighting when her life and the lives of others are at stake. She might not necessarily go for the kill, but she will fight with everything she has, as she always does. Since your team will be under fire from my army of Chitauri, they will be focused on them and not the true threats. Zatanna will cast a spell to freeze your team in place. Again, no one on your team has the magical capability to resist magic on Zatanna's level. MMH will appear behind them, as they are distracted from my army and frozen in place, and he will phase through your ice field if it is still up even after being frozen. From there, he will phase his hand through your team or just one-shot them with his superhuman strength and speed. You could try and argue that he wouldn't go for the kill right away, but either way, he will have the element of surprise and he has the strength and speed to quickly take out anyone on your team, especially since they will be immobile from Zatanna's spell. 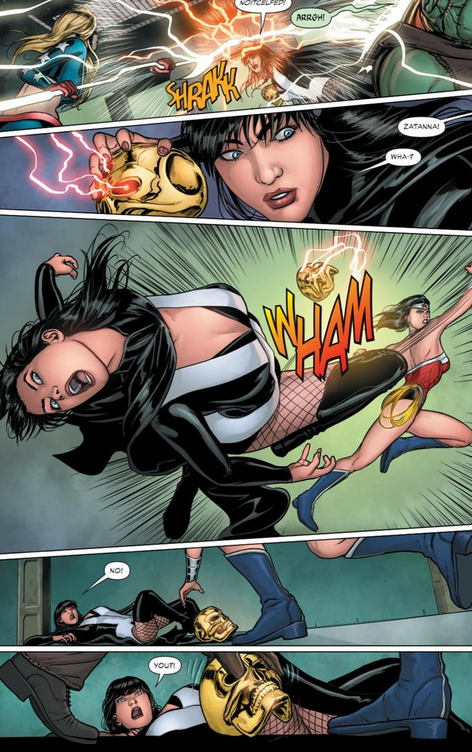 In the 1st scan, you will notice that Zatanna can strengthen her blasts just by saying so. 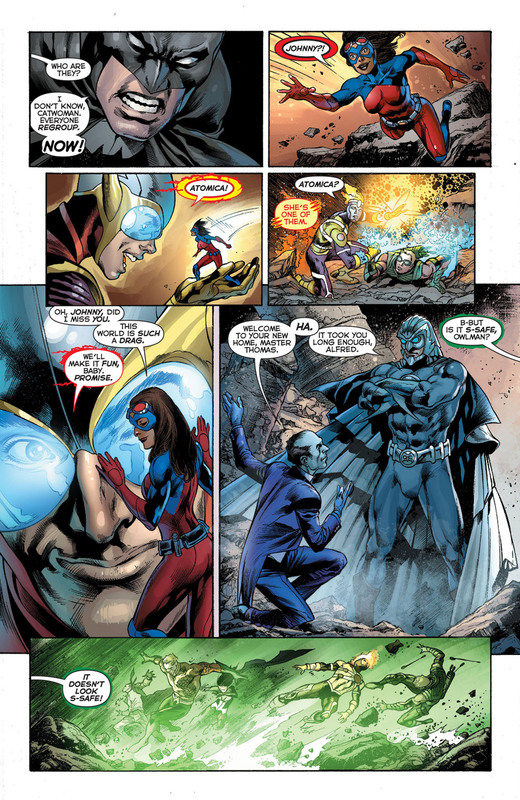 In the 4th scan (at the top right), you will notice that her blast can match that of a Green Lantern. With her light speed, she can fire off dozens of these blasts faster than your team can react. Even without a magical spell to shield her, she is quite durable, having withstood an AoE blast from Power Ring, and tanked a hit from a possessed Wonder Woman. Nanao Ise: Force field magic, healing, reflecting attacks with her sword...You provided no feats for the first two, and the third one is vague. Does the attack need to hit her sword? Does it redirect in a cone, an AoE? Is she immune to this redirection? Rukia: Do you have a feat or statement that says her AoE ice field is absolute zero or is that just an assumption? The light speed perk will certainly allow her to perform this attack quickly, but for how long can she maintain it, how big is the AoE? Can she maintain it while frozen in place and under assault? Xavier: I'm quite familiar with Xavier but you provided no feats for him. All he has is telepathy. MMH is superior to Xavier in telepathy and has a bunch of other powers he can use at the same time while he's "distracted" by Xavier. MMH is also significantly faster than Xavier and any of his attacks will KO him. Shunsui: His shadow teleportation seems kinda slow....and the injury sharing is vague. How is the AoE "city level", how quickly can he use it, for how long can he maintain it? Kisuke: More vague statements and feats....Energy magic --> how powerful is it, how quickly can he cast it, how quickly does it travel? Magic seals --> do they work on anyone/anything, how are they sealed, how quickly can he do this? Matter manipulation --> Zatanns can manipulate matter and transmute on a much more powerful/large scale. X-Men Team: Basically fodder. They can be taken down by less than 50 of my Chitauri, and that's me being generous. Feats of creating clones of others and feats of hiding bodies in shadows? Xavier can maybe stall MMH for a few seconds at most before he gets taken out by one of 200 Chitauri, Zatanna, or another attack from MMH. He's invisible. How would he be seen by your team? Even if MMH wasn't invisible, how would your team know to target him right off the bat? How would your magic dude survive long enough under the combined assault of my team to cast the seal spell? I would like some feats of this AoE attack, and proof it is absolute zero. And why would this be her go-to attack to start the fight? Feats of Asken absorbing magic of Zatanna's level? You literally provided no feats for this attack. I don't know what it is. That about sums up my opener! @boschepg: You still have 7 days. @boschepg: Well you have 1 more day till the deadline for your post. The debate itself has no deadline. How is the AoE "city level", how quickly can he use it, for how long can he maintain it? Energy magic --> how powerful is it, how quickly can he cast it, how quickly does it travel? Magic seals --> do they work on anyone/anything, how are they sealed, how quickly can he do this? Do you have a feat or statement that says her AoE ice field is absolute zero or is that just an assumption? The light speed perk will certainly allow her to perform this attack quickly, but for how long can she maintain it, how big is the AoE? Can she maintain it while frozen in place and under assault? I'm quite familiar with Xavier but you provided no feats for him. All he has is telepathy. MMH is superior to Xavier in telepathy and has a bunch of other powers he can use at the same time while he's "distracted" by Xavier. MMH is also significantly faster than Xavier and any of his attacks will KO him. I was just about to offer to take boshes place lol. There are so many inconsistencies with this power based on what you have shown. Instead of wasting time debating it, I'll just say that you do not have basic knowledge. You do not know who my team is until the battle starts, and even then, your characters know nothing of mine. Therefore, you have no valid reason to expose Askin to magic during your prep. Your point is moot. The injury sharing aspect of this power is still quite vague based on the limited showings you provided. I would need more context for it. So my team will feel a little cold and moody? That's it? How does the injury sharing translate to the entire AoE? Are you implying that everyone in that large AoE were also having their injuries shared? As for the energy and seal magic, I'm not really impressed...It seems to take a few panels to take effect. Furthermore, the scan you provided states that the seal affects the Reiatsu, which isn't something MMH or Zatanna have. Lastly, Zatanna can stop your team with a word at light speed before you can even use it. This would be problematic, but here's the thing: I need to be in the AoE for it to work. As I mentioned in my opener, Zatanna had cast a protective enchantment on the area, causing any intruders within to be transmuted into mollusks. At best, this would mean that my team would be momentarily frozen, while your team would be transmuted into mollusks, assuming we spawn in the same AoE. It is also highly possible that Zatanna would see this strategy coming, since she was able to see quite a few important elements of the future by using her divination magic, and this is your main strategy for the battle, making it quite relevant and important. If that were the case, she could shield herself and MMH could start off intangible. You can't assume people know everything about all of your characters. You still need to provide feats for your characters in any debate. Xavier is a sitting duck, who can be taken out in a second by Zatanna, MMH, or one of my 200 Chitauri. Can you show that then? Because you provided no feats of physical stats for any of your characters, which means that they have minimum strength, speed, durability, etc. They can be one-shotted by even a Chitauri blast. How exactly are they being taken out? As I said before, Xavier and the 5 X-Men are sitting ducks while in the astral plane, making them vulnerable to attack from Zatanna, MMH, or my Chitauri. It's not even in character for Xavier to immediately pull the X-Men into the Astral Plane, so by the time the battle starts and he does that, he'll already be tagged and killed. You have no reason to immediately focus on MMH. You do not have any knowledge on my team. All you will see are a decoy magic army of 200 Chitauri, and then the real army will be invisible and flying as they start shooting at you. Zatanna and MMH will be invisible as well. Even if you COULD see my team, why would you target the one human girl at the back when you are being confronted by a green alien and 200 other aliens? You actually failed to answer many of my concerns. You only answered the ones that suit you. Let's assume your cold field and Zatanna's protective enchantment and her first spell go off at the same time. Your team is frozen in place and transformed into a mollusk, and my team is momentarily frozen. As soon as my spells take effect, yours will end, my team is unfrozen, and we destroy your team. You have no reason to immediately focus on MMH. You do not have any knowledge on my team. All you will see are a decoy magic army and 200 Chitauri, and then the real army will be invisible and flying as they start shooting at you. Zatanna and MMH will be invisible as well. Even if you could see my team, why would you target the human girl at the back when you are being confronted by a green alien and 200 other aliens? You just stated that with perk that Zatanna's attack is the fastest on the board on your team to your battle mechanics which Im not disputing. How are they in astral battle when you stated and I agreed that Zatanna's magic would turn my clones into mollusk while your team is frozen from cold field AoE? Can you show that then? Because your provided no feats of physical stats for any of your characters which means that they have minimum strength, speed, durability, etc. They can be one-shotted by even a Chitauri blast. This would be problematic but here's the thing: I need to be in the AoE for it to work. As mentioned in my opener, Zatanna had cast a protective enchantment on the area causing any intruders within the area to be transmuted into mollusks. At best, this would mean that my team would be momentarily frozen, while your team would be transmuted into mollusks, assuming we spawn in the some AoE. Also, your strategy for your prep is outside your prep zone. You are talking about prep the battlefield with your enchantment in which is a perk you do not have. You have basic one hour prep just like me. She could see it, but as you stated in her opener, her divination is very vague and only sees aspects of the future. Also, most importantly, so are you protecting your team with shields at light speed or trying to cast your mollusks spell? You cant do both thus why I place how more of my team attacks you as a whole. Also, in my prep I made magic poisonous to your team and my team is unaffected by it by my No Friendly Fire perk. So my team will feel a little cold and moody? That's it? That is how the power is described and why Shunsui does not use it when friends are in the area. In fact, when he unleashed it on the scan provided, he actually had to go to another city were no one was at to not effect them. As stated, with my No Friendly Fire perk, I have no restrictions with such an AoE. Okay...Maybe it's because Im unfamiliar with Bleach and/or maybe its because you are being vague on purpose, but a lot of what you said is not clear to me. I just think you are over extending the capabilities on your team in the amount of time established with everything coming at you. While I have clones and multiple AoEs that only effect your team while protected in shadow dimension. I'm restricted because of the rules. No BFR, no reality warping, no time manipulation, etc. @boschepg: It doesn’t bother me much. Anyone who is familiar with Zatanna knows I am using her as well as I can given the rules of the tournament. @thenewguysnm1: You mean Haoalchemist does this alot? @boschepg: To make it easier for the readers, my initial comments have quotation marks and italics, and what Bosche responded is quoted underneath. My response is under that. "Your team is frozen in place and transformed into a mollusk and my team is momentarily frozen. As soon as my spells take effect yours will end, my team is unfrozen and we destroy your team"
You misunderstand. I meant that your team is frozen in place due to Zatanna's spell, not your cold field. The second part of your statement is also wrong, but I will address that shortly. "You have no reason to immediately focus on MMH. You do not have any knowledge on my team. All you will see are a decoy magic army and 200 Chitauri, and then the real army will be invisible and flying as they start shooting at you. Zatanna and MMH will be invisible as well. Even if you could see my team, why would you target the human girl at the back when you are being confronted by a green alien and 200 other aliens?" You don't know what perks I have... For all you know, Zatanna's speed could be baseline. You have no knowledge of anyone on my team. One vague statement of "more or less" feeling a specific person's Reiatsu means nothing. First of all, this doesn't necessarily apply to a combat situation. Second of all, Shinigami could have possibly only detected Ichigo's Reiatsu due to them knowing each other. Third of all, Reiatsu doesn't necessarily translate to Zatanna's magic, since it is spiritual energy and is not the same. Lastly, she will be invisible, as I have stated multiple times. "As I said before, Xavier and the 5 X-Men are sitting ducks while in the astral plane, making them vulnerable to attack from Zatanna. MMH or my Chitauri. Its not even in character to immediately pull the X-Men into the Astral Plane, so by the time the battle starts and he does that, he'll already be tagged and killed"
I wasn't agreeing with you, I was going along with what you said about them being in an astral battle. It's extremely debatable how MMH and Xavier's telepathy match up. Most people on CV would favour MMH. But the thing is, while Xavier is "stalling" MMH, he is still vulnerable to attack by Zatanna, the Chitauri, or even a simultaneous attack from MMH, since he can use more than one power at once. This stalling would last no more than a second, even with the X-Men helping Xavier. Their physical bodies would be destroyed, and you lose 6 people. "Can you show that then? Because your provided no feats of physical stats for any of your characters which means that they have minimum strength, speed, durability, etc. They can be one-shotted by even a Chitauri blast." Not covering physical stats in a battle puts your characters at the very minimum level of stats, which makes them slow, weak, and able to be one-shotted. Regardless, the physical stats of your team are nothing compared to MMH and Zatanna. You also only provided speed feats, which does put them above the Chitauri, but I have a decoy army of 200 Chitauri and a flying/invisible army of 200 Chitauri. With your strategy in mind, your team are sitting ducks and will be obliterated by an assault from 200 Chitauri. "Fair enough, but where did the clones you speak of come from? Still didn't get any feats for that part. You didn't even explain much about these clones..."
1) The portable gigai is an object, a piece of gear. Unless it is standard for your character, you cannot use it. 2) The only "clone" it makes is of Urahara, so it can't be used for your entire team. 6) They are not clones, but decoys. They do not have the same stats or powers as the original. Urahara replaced himself with it before he was struck. All of these points render your clones argument completely moot. You do not have any clones at all. This would be problematic but here's the thing: I need to be in the AoE for it to work. As mentioned in my opener, Zatanna had cast a protective enchantment on the area causing any intruders within the area to be transmuted into mollusks. At best, this would mean that my team would be momentarily frozen, while your team would be transmuted into mollusks, assuming we spawn in the some AoE." All prep takes place on the battlefield, unless you got the prep anywhere perks. Since we both have prep on the battlefield, when the battle begins, both of our preps merge into the battlefield, which includes my protective enchantment. These are the typical rules for CaVs, tournaments, etc. This means that your team will be within the area of my enchantment, thus turning your team into mollusks. Since you do not have any real clones, and you haven't proved you can hide your entire team in the shadows, your team gets incapped. "It is also highly possible that Zatanna would see this strategy coming since she was able to see quite a few important elements of the future by using her divination magic and this is your main strategy for the battle, making it quite relevant and important. If that were the case she could shield herself and MMH could start off intangible"
Yes, she sees aspects of the future. In your case, your cold field is your main element of your strategy and your claim to victory, so it is very possible Zatanna would see this. I can do both actually, because the protective enchantment that turns your team into mollusks was placed during my prep. This will result in your team being transformed as the battle begins, which will then stop my team from being frozen by your cold field. Zatanna then has free reign to cast spell after spell (at light speed) to assault your team or protect her own. I've said this like twice now but it seems I need to repeat myself: you do not have any knowledge on my team. You have no reason to expose Askin to magic because you do not know that my team has any magic-users. In your previous fight in the first round, you did not expose Askin to magic because your opponents had no magic-users. Once the battle starts and your team figures out Zatanna is a magic-user, it will be too late for you to expose Askin to magic and make it poisonous to Zatanna. You have not shown that Askin can be exposed to multiple things at once and make them all poisonous, so you couldn't even just expose him to everything in order to try and account for all situations. You can have the best prep in all of fiction, but if you do not know who my team is and you do not have any knowledge, you can't do anything to specifically counter my team. In our specific situation, this is the case. "How does your injury sharing translate to the entire AoE? Are you implying that everyone in that large AoE were also having their injuries shared"
Where is it described as such? You provided like one feat/scan of this injury sharing. I disputed this already. The protective enchantment that transforms your team into mollusks was cast during my prep. The divination also took place during my prep. Funny how you say you have a prep master but only bring up this "master prep" in your last post, and you don't even provide any specifics or details about it. Xavier, with all his power, can momentarily stall an inexperienced Cyclops with the Phoenix Force. Xavier will be an open target as he is stalling MMH and will get quickly obliterated by Zatanna or the 200 Chitauri. Your cold field gets stopped immediately because you get transmuted. You don't actually have any clones, and your AoEs won't take place since you will all be transformed. You also didn't show that you can hide and protect multiple people in the shadows, and if they are hiding, they won't be able to attack or use any of these AoE fields. You have no real clones, Askin has no reason to expose himself to magic since you do not have any knowledge that my team possesses a magic-user, and the injury share gets negated when you are transformed and can't even attack. @emperorthanos-: done. You can open for votes. @geekryan: that's three each. ready for votes? @boschepg: yup! It was a pleasure debating with you, and best of luck! Giving my vote to geeky. The whole light speed argument convinced me that reaction time would be an issue. Are you an idiot?! You do know my match is ongoing lol i have only made my opener,nobody is getting "Murked"
are you guys talking about our battle or your battle? @boschepg: has my vote, they demonstrated versatility, better layout, better plan of action, and just over great debating so he the champ.